After Lou admits sabotaging Lexie's garments, the two get into a fight which Nora has to put a stop to. Reb faints when she suddenly remembers that Joan tried to kill her. 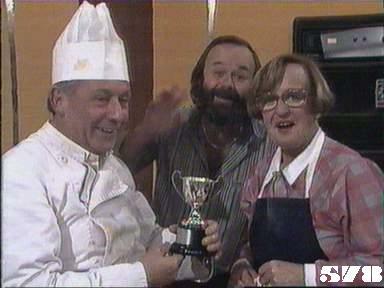 Mervin wins the cookery contest. Lexie says the teeshirts are to be photographed (rather than sold), so why didn't she just give them the designs rather than finished garments? Lexie appeals to Joan to let her do some work to fix up the teeshirts and Nora has to threaten to use her phone call to contact the Governor before Joan will relent and let them use the laundry. Joyce regards the cookery contest as already won and looks forward to her new microwave - until she tastes Mervin's practice run. The women help Lexie clean up and repair her T shirts. Reb meets the women and mistakes Willie at the piano for Judy: Lexie can hardly believe that the withdrawn young women is the Reb she's heard so much about. Reb leaves the rec room in confusion and meets Joan for the first time since her return to Wentworth. Joan tells Reb her father is dead, but Reb has no idea what she's talking about. Nora makes Lou admit she damaged Lexie's teeshirts, and demands she comes to help fix them, but Lou just laughs in her face. Lexie doesn't feel she got a satisfactory result in the limited time she has, and Julie has to remind her how ungrateful she is being. Reb finds out from Nora some of the things she did when she was last in Wentworth, and is warned to stay away from Joan. Willie takes over the kitchen for the day: Reb is brought to do kitchen duty and asks where Ray is. Nora tells Lou why she won't bash her: she claims she is afraid of going too far. Mervin has a fit from the stress, thus delaying his appearance at the cookery contest. His opponents are a French chef who's won the competition twice before and a Englishman who's worked at the famed "Bon Appetit" in Paris. The host of the TV programme makes stale jokes about "porridge" and the like. Nora invites Reb to try the press, which reminds her of the time her head was under it by Myra. She runs out of the laundry and finds the staircase where Joan pushed her over and looks back to see (or imagine) Joan following her up . Nora and May find her unconscious on the landing. The celebrity Peter Russell-Clarke has a chat to Mervin and tells him that "Francois" actually comes from Ballarat. Reb explains what she saw on the staircase to Nora, who takes it literally and tells Meg. Reb's accusation is reported to Ann in Joan's presence: for a moment Joan looks nervous, until she finds out the incident is supposed to have taken place a half hour ago, and she is able to point out that she has been in the Governor's office all the time. When she is questioned by Ann, Reb asks to be sent to Blackmoor, but Ann has to tell her the women there tried to kill her. Mervin wins the cookery contest over his snooty "English" and "French" rivals. Meg finds out from Reb's file that as well as a long history of physical ill-treatment (broken collarbone, ribs, arms, legs and a ruptured spleen) she was given ECT twenty seven times in the eight weeks following her nervous breakdown. I withdraw my previous suggestion that the hulking form at the piano when Reb thinks she sees Judy might not be an old shot of Betty Bobbitt but rather a stunt person in a grey wig. The clutter on the table in front of the piano and the noticeboard above it do look different from the way they are in the current episode , but thanks to David de Menna for suggesting and Mark Caffrey for confirming that the shot is from (526) when Dennis shouts at Judy for not listening when called. The brief shot when Reb imagines her head under the press does seem to be the actual shot from episode (506), but it doesn't include anyone else but Reb.